In art, truth — the search for it, the lack of it and the emotional pain these activities impose — is a universal concern. What is human life if not the constant pursuit of trustworthy community and informational reliability? The struggle provides endless creative inspiration. Yet somehow, in 2017 America, “Objects in the Mirror,” the work of Chicago native Charles Smith, arrives on the Goodman Theatre stage that much more urgently. As I write these words, our country is struggling through a nascent Constitutional crisis that has its roots in the mysterious relationship between the Trump administration and Vladimir Putin’s Russia. It could be months, even years before facts are laid bare and outcomes are decided. And while this catastrophe plays itself out on the world stage, works of art such as “Objects” remind us of an inescapable, universal truth. The reckoning always arrives. Always. Playwright Charles Smith met a young, hungry actor in Adelaide, Australia in 2009. As press materials detail, Smith’s friendship with Shedrick Yarkpai grew, ultimately resulting in this story of the actor’s “valiant 10+ year (1995-2007) journey from war-torn Liberia through a number of refugee camps in Guinea and Cote D’Ivoire, before his final relocation” to the Land Down Under. As played by Chicago actor Daniel Kyri, Shedrick is a conflicted survivor: loyal, earnest and brokenhearted over separation from his mother Luopu (the phenomenal Lily Mojekwu). He is determined to build a life of which he can be proud, despite years of human horror and Dark Side temptation. Though it’s impossible to be certain of playwright Smith’s process, it’s hard to overlook the parallels between Liberia’s brutal warlord Charles Taylor and the current President of the United States. The foot soldiers and water carriers of both regimes are desperate and disillusioned. In Shedrick’s retelling of his personal and national history, any community and security is sometimes preferable to frightened, isolated starvation. The Trump administration has steered clear of indiscriminate murder to be sure, but it’s not hard to feel the country slipping down an increasingly deep and morally corrupt surface. It’s a testament to Yarkpai’s story, Smith’s writing and Goodman Theatre resident director Chuck Smith (no relation) that “Objects” can feel so universal and personal, even as the action takes place “over there.” It also helps that every cast member is exquisitely talented and well chosen. In addition to powerful work from Kyri and the remarkable Mojekwu, Allen Gilmore as Uncle John Workolo is a revelation. Workolo is the relentless center holding his tortured family together. His personal motto, repeated more than once during the play’s two-hour, 15-minute runtime, is that his kin and he survive or fall as one. He channels his considerable energies and focus into the noble pursuit of his family’s survival. He also seeks a life of which he can be proud — one in which a relationship with the truth is dictated by circumstances of the moment. Uncle John thinks on his feet, but his decisions are not always kind. Gilmore wrings every bit of emotionally-relatable nuance out of the material. Ryan Kitley also turns in a good performance as Rob Mosher, an Australian lawyer who takes a personal interest in young Shedrick. The beauty of Kitley’s turn, the delicate artistry in fact of the entire cast, lies in uncertainty. It’s possible to believe every player in Shedrick’s story means well without any confidence that anyone is telling the truth. Shedrick himself, while certainly sympathetic, demonstrates unreliability as a narrator. Does he make up drug experiences as a test of Mosher’s loyalty, as he tells Uncle John, or is his father figure the one being tried? “Objects in the Mirror” is a gripping piece about the physical, metaphorical and spiritual challenges involved in living authentically. It deserves a wide audience. 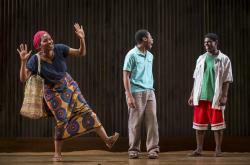 “Objects in the Mirror” runs through June 4 at Goodman Theatre, 170 N Dearborn, Chicago, IL. For information or tickets, call 312-443-3800 or visit the Goodman Theatre website.